Jimmy White ended the hopes of top women’s player Reanne Evans in the first round of the BetVictor Shoot Out in Watford on Thursday night. Evans, the 11 time World Women’s champion, was given a wild card entry to the quickfire one frame knockout tournament, becoming the first female player to compete in the televised stages of a ranking event in the UK. And she had chances to beat legend White, particularly when she trailed by just eight points at 27-19, but mis-cued when attempting to pot the black. White later made a break of 21 to seal a 54-26 victory and a place in the last 64. “If Reanne had beaten me tonight I wouldn’t have been that disappointed because she’s a good friend of mine and I know what a good player she is,” said 56-year-old White. “We both had chances and it was lucky for me that she mis-cued at a vital time. I’ve played her many times in exhibitions and she’s a lot better than that. Ben Mertens, a 14-year-old amateur wild card from Belgium, reached the last 64 with the most dramatic win of the opening day. Up against former world number three James Wattana, a player 35 years his senior, talented potter Mertens built a lead of 29 points at 60-31. Wattana had a chance to clear up and got within a point at 59-60, only to run out of time when he just needed to pot the pink for victory. Kyren Wilson came from 60-0 down to beat Ian Burns by a single point. Wilson made 45 before missing the yellow, but got another chance and potted green, brown, blue and pink to go 63-62 ahead. Burns tried twice to double the black but missed his target before the time ran out. Ricky Walden made a fantastic break of 132 to beat 12-year-old Liam Davies. That was the second highest break ever in the Shoot Out, topped only by the 135 from Martin Gould in 2012. 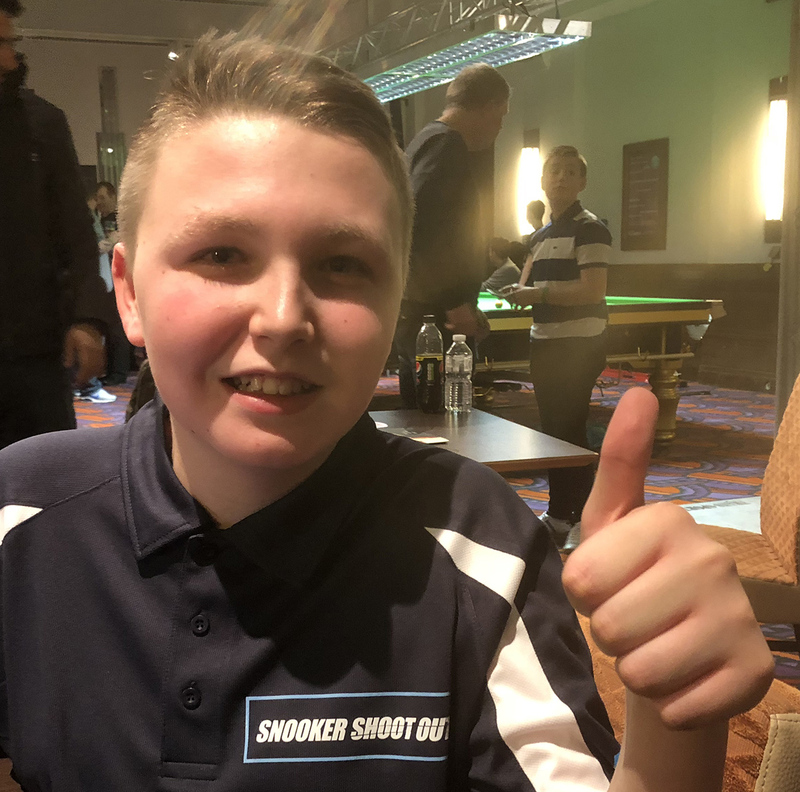 Zhao Xintong, one of the four players who can earn a place in the Players Championship by winning the tournament (for more on that story click here) beat Joe O’Connor 59-2 while former World Champion Ken Doherty made a break of 59 to beat Adam Stefanow. Barry Hawkins, who won this event in 2012, beat Simon Lichtenburg 68-7 while European Masters champion Jimmy Robertson made a 63 to beat Zhang Jiankang. Germany’s top player Lukas Kleckers beat Jamie O’Neill 64-0. The world ranking event at the Watford Colosseum runs until Sunday. All matches last a maximum of ten minutes, with a shot clock of 15 seconds for the first five minutes and ten seconds for the last five. Limited numbers of tickets are still available – for details click here.